Home › Blog › Breakfast All Day – IHOP Express® at WinStar! Breakfast All Day – IHOP Express® at WinStar! We had you at “breakfast all day,” didn’t we? WinStar World Casino and Resort is now home to a brand-new IHOP Express®, meaning your IHOP favorites can now be enjoyed all day, every day at the world’s largest casino. (That’s right, IHOP Express is open 24/7!) Head to the Madrid Gaming Plaza to savor all the pancakes and French toast your heart desires. You will not be disappointed! Interested in what’s on the menu? 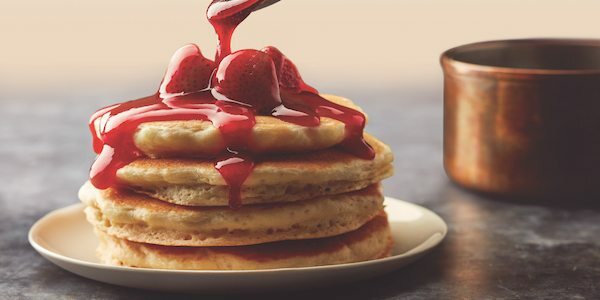 The most popular IHOP food, including the breakfast chain’s world-famous Buttermilk Pancakes, fluffy omelettes, hickory-smoked bacon and International House Roast Coffee® are all being served. Don’t worry, signature menu items like sandwiches and hand-seasoned, 100-percent USDA choice beef burgers are here too! The IHOP Express experience is unique and convenient. When you enter the restaurant, head to the counter to order and one of our team members will deliver your fresh and made-to-order meal to your table in the dining area. Picture this, you’ve had an incredible day exploring and experiencing all WinStar has to offer, and you can enjoy the comfort of your favorite breakfast classics without leaving the resort. The smell of coffee, sizzling bacon, fluffy homemade pancakes and all the amenities at WinStar – what more can you ask for? We can’t wait for you to experience the all new IHOP Express! When you visit, be sure to share your experience on Facebook, Twitter or Instagram!